Find hotel near Padanilam Parabrahma Temp .. This temple is said to be one of the major temples in Kerala. It is dedicated to Lord Parabrahma. The most unique fact about this temple is, it doesn’t have any boundary walls and roofs. Locals says that the temple was built with the concept of treating all worshippers equally. That’s why, people belonging to different religious background come here to offer their praying. Believing on this concept, the temple authority also appointed non-Brahmin priests to perform the rituals. However, if you are keen to know about the history of the temple then you might get disappointed. This is because, it is still unknown even to the locals. Still, the magnificent architecture and the large deity of the temple deserves a visit. Every visitor is allowed to take part in the celebrations related to temple. You can visit the temple any time of the day. 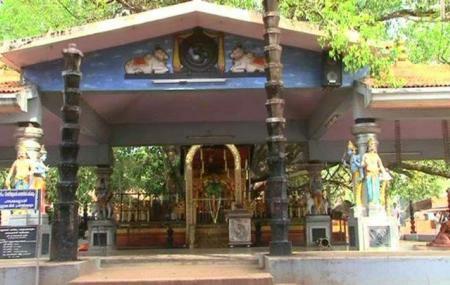 How popular is Padanilam Parabrahma Temple? People normally club together Vethalan Kavu Mahadeva Temple and St George Orthodox Church while planning their visit to Padanilam Parabrahma Temple. Pray for peace and prosperity. A renowned Brahma TEMPLE like ochira Brahma TEMPLE. Thousands of devotees are worshipping here. All needed facilities to the devotees are available here. Sivarathri maholsavam.. i enjoyed a lot with my friends. nice temple. Great Experience. The power of Omkaram.